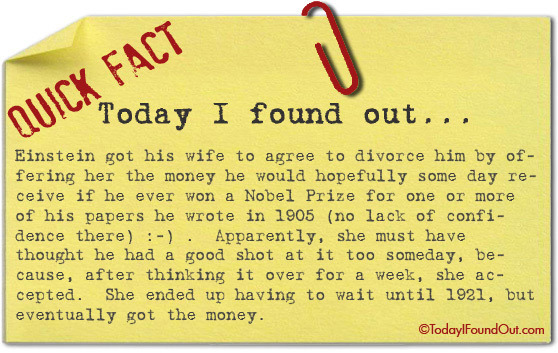 Einstein got his wife to agree to divorce him by offering her the money he would hopefully some day receive if he ever won a Nobel Prize for one or more of his papers he wrote in 1905 (no lack of confidence there) 🙂 . Apparently, she must have thought he had a good shot at it too someday, because, after thinking it over for a week, she accepted. She ended up having to wait until 1921, but eventually got the money. @TheIrreverend: “Close, but no cigar”. Actually… cigar. Here’s some sources Time Magazine (listed in the above sources), PBS, Highfield and Carter page 187: 180,000 Swiss Francs, The Collected Papers of Albert Einstein, Vol. 8, doc. 562., etc. When she finally received the money, she used it to buy three homes, one five story house for living in, and two more as investment properties. There’s no disputing that Einstein’s wife did receive some of the Nobel Prize money, but it was prearranged in the divorce agreement, and was to be held in trust for their two children. At the time of the agreement, Einstein was almost certain he would receive the Nobel and this was very much a plan. The details you have provided do fit perfectly with the Lucas story however.